San Diego County Crime Stoppers along with investigators from the San Diego Police Department’s Robbery Unit are asking for the public’s help in identifying and locating an unknown suspect wanted for two separate commercial armed robberies in San Diego. On February 8, 2018, at about 5:35 a.m., an unknown male suspect robbed the Adult Depot located at 4055 Pacific Highway, in San Diego. On February 9, 2018, at about 4:25 a.m., the same suspect robbed the 7-Eleven located at 4919 University Avenue, in San Diego. In both cases the suspect walked into the businesses armed with a shotgun, and demanded money from the registers. The suspect is described as a Hispanic male, 20 to 30-years-old, 6’0” to 6’2” tall, weighs 230 to 250 lbs., with dark colored hair and eyes. The suspect was wearing a black baseball cap, dark colored pants, and white tennis shoes during both of the robberies. 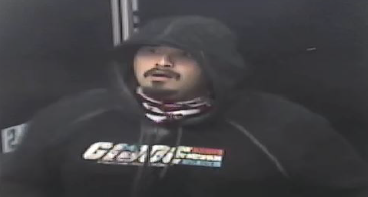 During one of the robberies, the suspect was wearing a dark colored hooded sweatshirt with “GIJOE” printed on the front. In both cases, the suspect fled the area in a dark colored, 4-door sedan (possibly a 2000-2006 Nissan Sentra) with black wheels and a broken out driver’s side window. Anyone with information on the identity and or location of the suspect is asked to call the SDPD’s Robbery Unit at (619) 531-2299 or the Crime Stoppers anonymous tip line at (888) 580-8477. Crime Stoppers is offering up to a $1,000 reward to anyone with information that leads to an arrest in this case. Visit the Crime Stoppers website at www.sdcrimestoppers.org for more information on how to send anonymous web and mobile app tips.